Whether you’ve been keen on your senior loved one’s nutrition or not, this need remains to be vital in a senior person’s overall well-being. After all, food can provide our bodies with the essential nutrients they need. Being able to eat the right kinds of food is therefore important in their aging season. 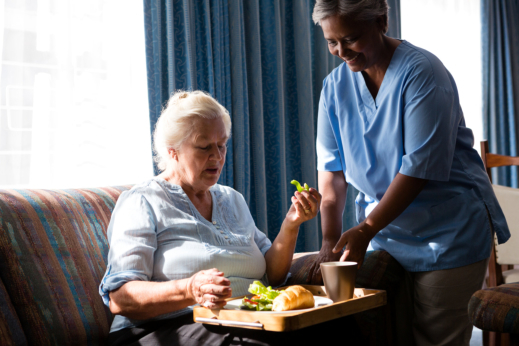 As your partner in providing Home Care Services in Warren, Michigan, let us help you provide quality care to your aging loved one with these tips on proper elderly nutrition. Allow these tips to guide you on how to monitor and meet the nutritional needs of your senior loved one. In their aging years, your family member will have recommended serving of a particular food group in their daily meals. They may even have food restrictions admonished by their doctors. These guidelines need to be followed so that you can ensure that your aging loved one is getting the right nutrition fit for their age. Fruits and vegetables are complete suppliers of our basic nutritional needs; hence, serving them to our aging loved ones is very ideal. Ensure that you serve the fresh ones, as these are tastier, suppler, and more appealing to their palate. Choosing fruits and vegetables is always a good decision to make. So that you can serve fruits and vegetables, it’s also essential that the food supplies contain these. Ensure that when you’re in the grocery store, you’re not just shopping for other healthy food choices, but also with fruits and vegetables. Feel free to get providers of In home care in Michigan to assist you in shopping for these food essentials. Sometimes, eating the same kind of food over and over again can be boring, and this can be a trigger for a loss of appetite. To prevent this from happening, try learning other recipes that are equally nutritious for your aging loved one. If you have more time, you can study from different online sources readily accessible. In preparing healthy meals for your aging loved ones, you might also need professional assistance from providers of Non Medical Home Care. These are skilled individuals who know how to lend you a hand in caring for a senior loved one at home. Feel free to tap their help when meal preparation becomes a challenge for you. Which part of checking your senior loved one’s nutrition is challenging for you? Don’t let this bother you any further as professional care providers can be of help. Our team at Precious Time Non Medical Home Care Concierge Services, LLC can assist you even if it’s just for preparing nutritious meals for your aging loved one. These few hours of food preparation are already instrumental in the overall health and wellness of your senior loved one. Would you like to learn more about our services? Contact us! This entry was posted in Nutritious Meals and tagged Fruits and Vegetables, Healthy Food, Nutritious Recipes, Senior Care, Serve Fruits.